I don’t often get requests, but this is something that’s been asked of me several times. 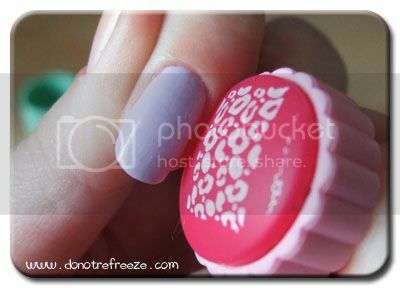 If you’re new to stamping nail art, and haven’t yet read my Konad Q&A post from back in January, I highly suggest you do that first! 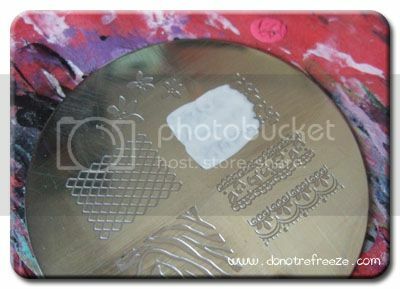 I’m not going to reiterate everything I said regarding hints and tips in this post, I’m just showing you my method for stamping. A couple of things – don’t be puzzled by the bare, yellowing nails in the photos. They’re mine. I only painted three of my nails for this tutorial. And also, thanks to my sister Rachel who took some of the photos for me when both my hands were in use! 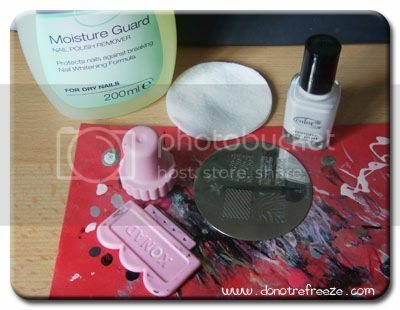 First of all, I make sure I have all the bits and pieces that I need out in front of me: The image plate, stamper and scraper, the polish I am stamping with, and a cotton wool pad soaked in nail polish remover. Then I only apply polish to part of the design. I did a bit more here that I would usually do, I’ll normally only cover half the image. Now, when I take the scraper over the design, not only does it remove the excess polish but it fills in the parts of the design that I didn’t paint over, thus saving on polish! I hardly think you need instruction on picking up the design on the stamp, just press it down firmly and lift up again. This is where my technique varies from most. Most people will keep their finger to be stamped flat on the table, but I find I get MUCH more control like this, just holding my hand with my fingers curled over, supporting the finger to be stamped with my thumb. I roll the stamp from right to left on my left hand, and from left to right on my right hand. 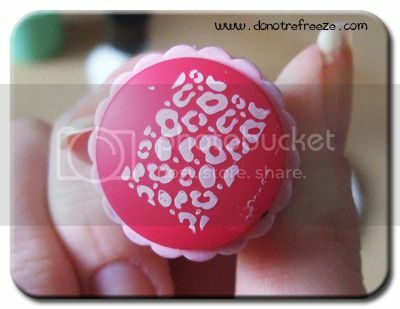 Like this, I can better control the placement of the design on the nail and I get a cleaner, neater stamp. Rolling the stamper across the nail; note that my thumb is giving support to my index finger! And done. There is no way of avoiding the stuff you will get on your skin, but you can just remove it with whichever method you prefer. If you’re not one for cleaning up with acetone and a brush, then just a wipe with a cotton bud dipped in polish remover will do. Don’t be limited by the designs as they come. I wouldn’t wear these three together in a proper manicure, I’m just showing you a couple of designs. Don’t be afraid to experiment by layering different designs on top of others, and stamping in different colours! Try combining Konad with different nail art techniques too. For example, the flower on my middle nail is one that I LOVE to add a rhinestone to the centre of whenever I wear it. 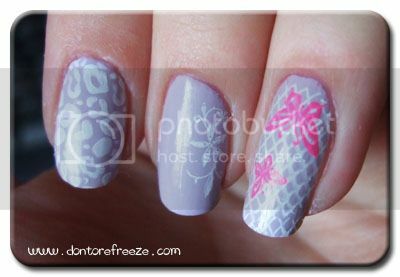 To see more stamping nail art that I’ve done over the last year, be sure to click the Konad tag over in the left hand sidebar. I hope that was helpful to some of you, especially those of you who’ve tried Konad before and were discouraged by not being able to get a clean or even stamp. I think the position I keep my hands in whilst stamping really contributes to the quality of the finished design. Again, don’t forget to refer to my Konad Q&A for a wealth of information on getting started with Konad, and troubleshooting tips. Good luck! Great tutorial, I also never put my hands flat on the table! Otherwise, I can’t see what I’m doing. This is most helpful ! P.s did you get me DM on twiiter ? Painting only half of the design was a great suggestion, thanks! Hi you have great nail posts!Love it! !I am following ur blog.Can’t wait for more post.I have the same Konda plate! !